In this section you’ll learn about the role of supply chain management and logistics in the production of goods and services. The following video provides an overview of the importance of supply chain management and logistics. Customers: Customers start the chain of events when they decide to purchase a product that has been offered for sale by a company. If the product has to be manufactured, the sales order will include a requirement that needs to be fulfilled by the production facility. Planning: The planning department will create a production plan to produce the products to fulfill the customer’s orders. To manufacture the products, the company will then have to purchase the raw materials needed. Purchasing: The purchasing department receives a list of raw materials and services required by the production department to complete the customers’ orders. Inventory: The raw materials are received from the suppliers, checked for quality and accuracy, and moved into the warehouse. Production: Based on a production plan, the raw materials are moved to the production area. These raw materials are used to manufacture the finished products ordered by the customer and then sent to the warehouse where they await shipping. Transportation: When the finished product arrives in the warehouse, the shipping department determines the most efficient method to ship the products so they are delivered on or before the date specified by the customer. Take a look at the following video about BYU ice-cream production. Can you identify each of the elements, above, in BYU’s supply chain? When used in a business sense, logistics is the management of the flow of things between the point of origin and the point of consumption in order to meet requirements of customers or corporations. The resources managed in logistics can include physical items such as food, materials, animals, equipment, and liquids, as well as abstract items, such as time and information. The logistics of physical items usually involves the integration of information flow, material handling, production, packaging, inventory, transportation, and warehousing. There is often confusion over the difference between logistics and supply chains. It is now generally accepted that logistics refers to activities within one company/organization related to the distribution of a product, whereas supply chain also encompasses manufacturing and procurement and therefore has a much broader focus, as it involves multiple enterprises, including suppliers, manufacturers, and retailers, working together to meet a customer’s need for a product or service. One way to look at business logistics is “having the right item in the right quantity at the right time at the right place for the right price in the right condition to the right customer.” An operations manager who focuses on logistics will be concerned with issues such as inventory management, purchasing, transportation, warehousing, and the planning and organization of these activities. Logistics may have either an internal focus (inbound logistics) or an external focus (outbound logistics). A manager in charge of inbound logistics manages everything related to the incoming flow of resources that the company needs to produce its goods or services. These activities will include managing supplier relationships, accessing raw materials, negotiating materials pricing, and arranging quicker delivery. A manager working in outbound logistics will be focused on two issues: storage and transportation. 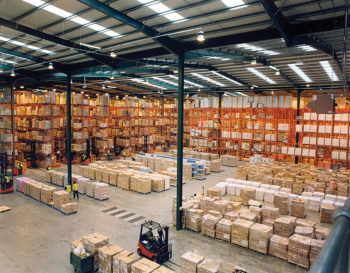 He or she will use warehousing techniques to keep the finished goods safe and accessible. Since the products may need to be moved out to a customer at any moment, proper organization is crucial. Having as little product stored as possible can be advantageous since stored products are not making money, so the outbound logistics manager often has to balance company cost savings with consumer demand. The transportation function is by far the most complex part of outbound logistics. Without transport, there simply is no logistics. For that reason it’s critical to be able to move the product from one location to another in the fastest, most cost-effective, and efficient way possible. Since transportation involves fluctuations, factors such as delays and changes in fuel costs need to be taken into account in order to cover all possible scenarios that might jeopardize the efficient movement of goods.